My research examines the evolutionary relationships of teleostean fishes and explores molecular and morphological evolution within a phylogenetic framework. Of specific interest are fishes that inhabit the deep sea, as the extreme habitats of this environment have produced fascinating evolutionary events among the 4000-6000 species of marine fishes that have invaded this realm (e.g., telescopic eyes, bioluminescence, hermaphroditism). My research program focuses on the evolution of the bony ray-finned fishes (Actinopterygii) through a synthesis of molecular and morphological information to test hypotheses of evolutionary relationships. I use phylogenetic hypotheses as frameworks to investigate a breadth of evolutionary questions related to organismal diversity and diversification. My program focuses on exploring the evolution and biodiversity of taxa found in the deep sea, and I am interested in addressing a number of evolutionary questions and topics related to fishes that inhabit this realm, including; estimating divergence times, temporal changes in diversification rates, character evolution, correlations between speciation rates and evolutionary adaptations, ecological habitat shifts, and biogeography. Please see below for further information regarding my research program. The initial focus for all of my studies is to provide a robust phylogenetic framework for teleost lineages that have independently invaded the deep sea using a combination of morphological and genomic data. These phylogenomic frameworks serves as the basis for investigating evolutionary questions associated with: divergence times, reconstructing character evolution, and hypotheses associated with diversification. Davis, M.P., Sparks, J.S., and Smith, W.L. (2016). Repeated and Widespread Evolution of Bioluminescence in Marine Fishes. PLOS ONE. 11(6): e0155154. Near, T.J., Eytan, R.I., Dornburg, A., Kuhn, K.L., Moore, J.A., Davis, M.P., Wainwright, P.C., Friedman, M., and Smith, W.L. (2012). Resolution of ray-finned fish phylogeny and timing of diversification. Proceedings of the National Academy of Sciences. 109(34):13698-703. Davis, M.P., 2010. Evolutionary relationships of the Aulopiformes (Euteleostei: Cyclosquamata): a molecular and total evidence approach. In: Nelson, J. S., Schultze, H.-P., and Wilson, M. V. H. (Eds. ), Origin andphylogenetic interrelationships of teleosts. München (Verlag Dr. F. Pfeil). PP. 431-470. Estimating divergence times for deep-sea lineages are critical to exploring the evolutionary timing of character evolution, temporal diversification studies, and the phylogenetic history of the groups themselves. My research incorporates our knowledge of the teleostean fossil record within a phylogenetic framework to address questions related to divergence time estimation for marine and deep-sea lineages. Davis, M.P., Arratia, G.A., and Kaiser, T. (2013). The first fossil shellear and its implications for the evolution and divergence of the Kneriidae (Teleostei: Gonorynchiformes). In: Arratia, G.A., Schultze, H.P., and Wilson, M.V.H. (Eds. ), Mesozoic Fishes V. München (Verlag Dr. F. Pfeil). PP. 325-362. Davis, M.P., and Fielitz, C. (2010). Estimating divergence times of lizardfishes and their allies (Euteleostei: Aulopiformes) and the timing of deep-sea adaptations. Molecular Phylogenetics and Evolution, (57) 3:1194-1208. Due to the environmental pressure of the deep-sea, characters associated with this habitat (e.g., enlarged teeth for entrapping prey, bioluminescence, hermaphroditism, and body shape/depth), have been hypothesized to have convergently evolved with potential impacts on diversification. My work explores the number of times these adaptations have independently evolved acrosslineages of fishes and if any of these adaptationsrepresent key innovations that are promoting rapid diversification in species-rich deep sea lineages. Sparks, J.S., Schelly, R.C., Smith, W.L., Davis, M.P., Tchernov, D., Pieribone, V., and Gruber, D.F. (2014). The Covert World of Fish Biofluorescence: A Phylogentically Widespread and Phenotypically Variable Phenomenon. PLoS ONE. 9(1): e83259. Significant increases or decreases in diversification are a possible mechanism for explaining the present distribution of species richness across the tree of life; however, there have been few studies investigating patterns of diversification in lineages occupying the deep-sea. I use temporal frameworks from molecular phylogenies to investigate character-dependent diversification and shifts in diversification rates in deep-sea lineages. Martin, R.P., and Davis, M.P. (2016). 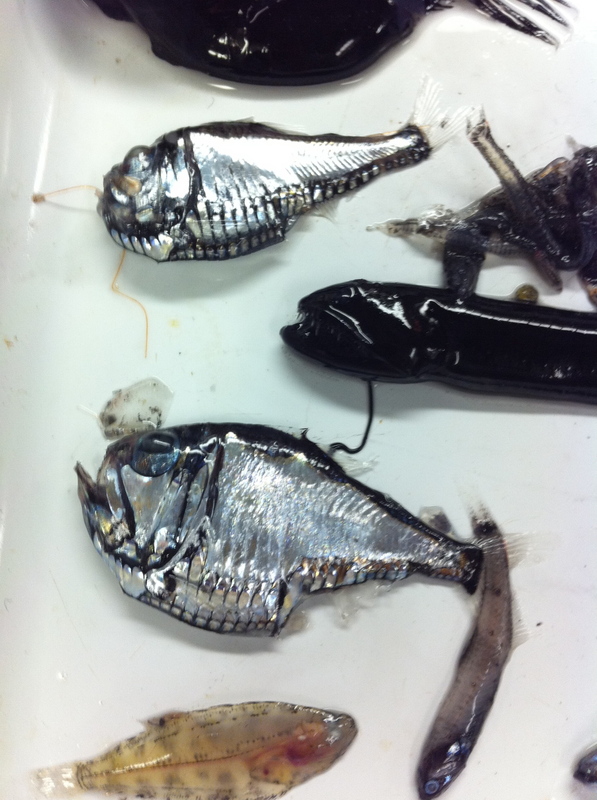 Patterns of Phenotypic Variation in the Mouth Size of Lanternfishes (Teleostei: Myctophiformes). Copeia. 104(4):795-807. Davis, M.P., Midford, P.E., and Maddison, W. (2013). Exploring power and parameter estimation of the BiSSE method for analyzing species diversification. BMC Evolutionary Biology. 13:38 DOI: 10.1186/1471-2148-13-38. Highly Accessed. There is still much to learn about the biology, biodiversity, and evolutionary history of species that inhabit the deep sea, despite it being the largest habitat on Earth. I promote knowledge of deep-sea biodiversity through the dissemination of my research and participation in public outreach programs. Understanding biodiversity in the deep sea is fundamental to addressing key conservation questions regarding this realm. My research program helps address this issue by studying the biology, evolution, and biodiversity of the deep sea in an effort to contribute to answering the fundamental conservation question of “What is out there?” It is also important to identify areas of endemism and hyper-diverse “hot spots” of biodiversity in the deep sea, as prioritizing conservation in “hot spots” can help preserve higher numbers of diversity with the resources available. Davis, M.P. (2015). Evolutionary Relationships of the Deep-Sea Pearleyes (Aulopiformes: Scopelarchidae) and a New Genus of Pearleye from Antarctic Waters. Copeia. 103(1):64-71. Davis, M.P., and Chakrabarty, P. (2011). Tripodfish locomotion and landing behavior (Aulopiformes: Bathypterois) from video observations at bathypelagic depths in the campos basin of Brazil. Marine Biology Research, (7) 3:297-303.